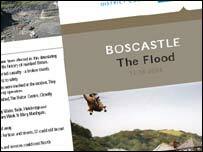 A leaflet about the Boscastle flood has been published. North Cornwall District Council's Coast and Countryside team wrote the brochure in response to interest from visitors in the village and surrounding area. The brochure describes the flood's devastation and aftermath and also has historical information on previous floods in the South West. Proceeds from it sale will go towards re-establishing the village visitor centre, which was destroyed. Charlie David, Head of the Coast and Countryside service said: "Boscastle and surrounding areas suffered terrible devastation during the floods. "Homes, businesses and the village's infrastructure were all affected. "We are hoping this leaflet will answer some of the many questions about Boscastle we are frequently asked, and give people an insight into what took place that day."